As a senior at the University of Pennsylvania's Wharton business school, Anjali Sud applied to dozens of jobs in investment banking. She didn't get any. 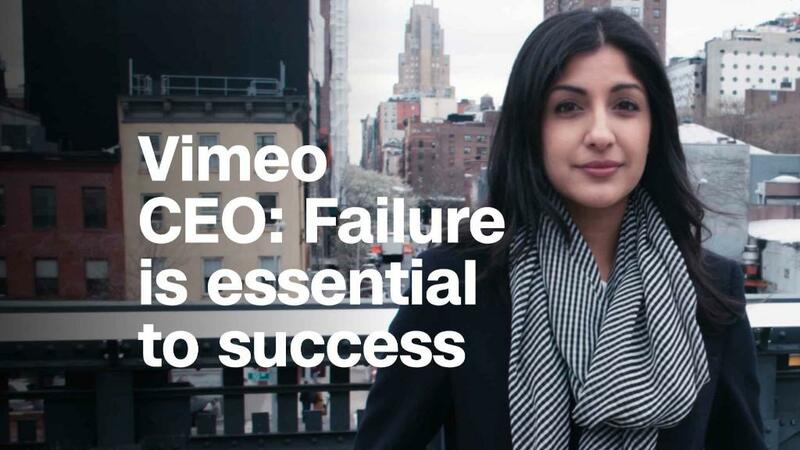 "I got rejected from every single big investment bank," Sud, now the CEO of Vimeo, told CNNMoney. "I remember leaving one of the interviews, and they told me that they didn't think I had the personality to be a banker," she recalled. "That definitely was a low point." "It was the first time that I really felt like this was something I wanted to do and I couldn't do it," the 34-year-old recalled. But Sud had faced challenges before. As a young teen in Flint, Michigan, she applied on a whim to a prestigious boarding school in Massachusetts. She was accepted, and left home at the age of 14. At first, Sud had a difficult time in the academically rigorous environment. "I failed a lot in my first year," she said. "I had to work really hard to catch up. I think that was a wake-up call that most people probably don't get at 14." Despite the negative feedback, Sud didn't give up on her search for a job in investment banking. Ultimately she took a job as the first analyst for a small firm, Sagent Advisors. At Sagent, Sud learned the skills that would help her succeed later on. "I found myself doing things that most investment bankers don't get to do," she said. Sud hired and trained new analysts, helped the fledgling company expand internationally and worked on partnerships. The time at Sagent "taught me that sometimes the non-traditional path can be the best one," she said. "I have gotten advice to not move around so much ... and to stay focused in one path," Sud said. "I've gotten advice to stay in my lane and not be so impatient about my own career growth." But Sud ignored that advice. "I wanted a diversity of experiences because I thought it would make me a better leader and a better decision maker," she said. The approach paid off. Sud went from Amazon (AMZN) to Vimeo, where she started out as a leader in the global marketing department. "That was a really valuable business opportunity, and an area no one was really focused on," Sud said. She made the case to Vimeo, and "because of that, I was given an opportunity to run the company." She credits her speedy rise to that ability to carve out her own path. "You can create your own opportunities," she said. "It's sometimes really smart to look where others aren't looking." Looking back, Sud wishes she had worried less about having a linear career path. "The advice I wish I had known is 'don't sweat it so much,'" she said. Sud values the guidance she received from her parents. "Growing up, my dad would always tell me and my siblings to pursue the world," she said. "He taught us to never make decisions based on your fears, always make them based on your strengths." That doesn't mean avoiding failure. "Failing early and often can be really empowering," she said. "Failure is essential to success." Those early failures helped her ignore the people who told her to ask for less. "I probably don't look like, or seem like, a CEO of a company of the size of Vimeo," she said. "Don't let people tell you you're not a good fit for things."